The First Piece Of Apparel To Bear A Company Logo Was A? Apparel covered in logos big and small is commonplace today, but as late as the early 20th century such branding was unheard of. 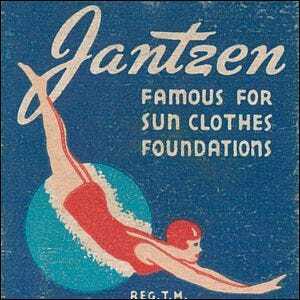 In fact, the first logo to appear on manufactured clothing didn’t make an appearance until 1923 when the Jantzen swimwear company began branding their swimsuits with a tiny little logo, seen here, of a female diver. The “Diving Girl” as she became known featured prominently both as a logo on clothing and in early advertising. The logo remains the longest lived apparel icon in the world as it has been in use, with very minor revisions, since first appearing in print advertising in 1920.